Luton Hoo Hotel, Golf & Spa is a Grade I listed, 5 star hotel on the border of Hertfordshire and Bedfordshire. It has been featured in famous films like Four Weddings and a Funeral and Eyes Wide Shut. The hotel is also home to a challenging golf course with 4 different tees, including a ladies course. The beautiful spa has an indoor pool with a view onto woodlands, and is housed in the property’s original stables courtyard. Imbued with a calming and relaxed atmosphere, you can really unwind here. Other facilities include six treatment rooms, relaxation lounge, vitality pool, sauna, steam room, and gym. Whether you’re looking for a quick facial or pedicure, or an indulgent spa day, every treatment at Luton Hoo is unique. The Spa at Luton Hoo provides a true sense of escape, from the moment you slip on your robe and walk through to the relaxation area, to that moment of total calm as you sit by the pool and take pleasure in the natural surroundings. ESPA, OPI and Camellia Tea are used to create a complete Spa experience and our wide range of treatments are perfectly suited for both men and women. Whether you are a resident guest on a spa break package or just visiting for a day of relaxation, The Spa at Luton Hoo is the ideal luxury hideaway for you to truly pamper yourself. 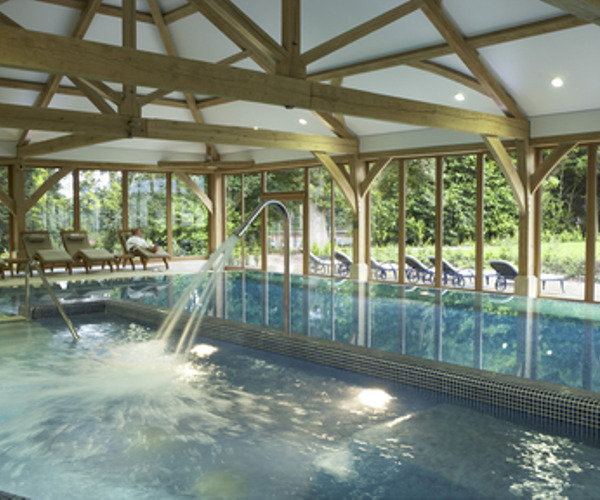 Guests can also enjoy the indoor and outdoor relaxation areas, use of our infinity swimming pool, vitality pool and heat therapy suite all housed within the stunning oak framed building. But appearances can be deceptive because the historic stables, designed by Robert Adam, is now home to a luxurious spa, a fully equipped gym and a stunning indoor pool with views onto woods and grounds. The Adam's Brasserie offers all day dining in a relaxed and laid back atmosphere, whilst next door the Adam’s Bar and 19th are always popular with golfers fresh from playing 18 holes. For exquisite fine dining there can be few more spectacular settings than The Wernher Restaurant, named after one of Luton Hoo’s most distinguished former owners. This part of the Mansion House was extensively remodelled in the early 20th century by the architects of the Ritz Hotel in London. It’s exotic marble panelwork and richly coloured fabrics are reminiscent of the Palace of Versailles. Luton Hoo certainly sets the standard for all the other luxury hotels in Bedfordshire and Hertfordshire to follow. There is a wide range of room and suite options to suit your taste and budget, and each one has been individually furnished and decorated to reflect its unique character, sometimes featuring silk lined and panelled walls, marble fireplaces and ornately decorated ceilings. Nearly all of the rooms also afford stunning views of the gardens and rolling parkland beyond. The Parkland wing, a short walk from the Mansion House, has 38 air-conditioned bedrooms and suites, each equipped with flat-screen LCD television and broadband. Ground floor room and suites have their own private terraces, but to get the full effect of the sweeping views across the grounds the Roof Garden Suite is unmatched. The Club House, built into the Grade II* listed Robert Adams stables which also houses the Spa, comprises 12 bedrooms with oak beams and vaulted ceilings. Some of the rooms have four-poster beds and are furnished and equipped with the golfer and Spa guest very much in mind. Similarly, The Flower Garden wing, adjacent to the Spa, offers another 59 air-conditioned bedrooms and suites. And Warren Weir, a private, virtually self-contained venue, tucked into a loop of the River Lea, offers another 84 tastefully furnished bedrooms for both private functions, weddings and business events. Renowned amongst Bedfordshire and Hertfordshire luxury hotels for the quality of its facilities and service, at Luton Hoo you will enjoy the height of comfort.